I want to say a HUGE thank you to Whitney @ Whit Reads Lit for nominating me for this award! 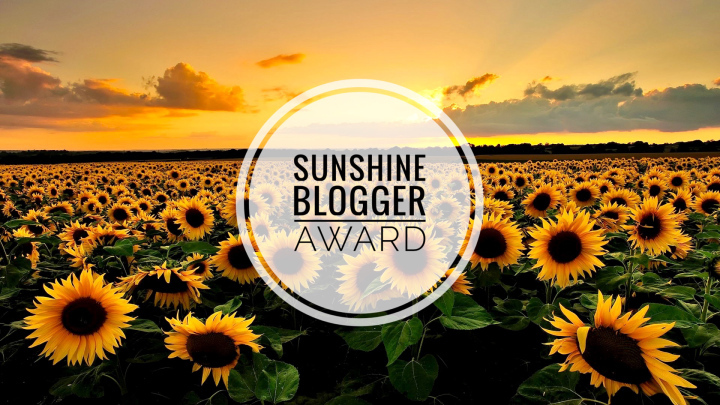 The Sunshine Blogger Award is an award for bloggers who inspire and spread positivity and joy. For me it means my hard work has been noticed and that is such an honor. This is a tough one because I am such a mood reader! But when all else fails, a contemporary usually does the trick. I am not sure I know what a ‘pilgrimage’ would entail so I don’t know how to answer this question! Yeesh. I mean obviously I have read 7 books by JK Rowling…I just can’t think of any other authors I may have read more from. I try to post at least once a week (though sometimes it does get away from me). Which I guess in turn would mean that I post at least 3-4 times a month. I like to read on the couch in my living room, or my front porch. Somewhere I won’t be distracted by people or screens. I like to watch movies or play board games with my family/friends. Since I am such a mood reader, I tend to just look at my bookshelf until something really jumps out at me. Most of the time I will see a spine of a book and know that I am in the mood for that kind of story. Who has inspired you in your blogging style? What are some of your must read bloggers? Who do you call when you need a ‘pick me up’? What is a go-to happy story you like revisit? Are you more of a morning person, or evening person? Can you think of a place or object that you associate with a happy memory? What is it? What are some of your favorite blogging moments? What makes a book an instant buy for you? Appealing cover, specific author, specific topic, etc? There are a number of people/blogs I could nominate for this award! Luckily, I have surrounded myself with some pretty positive people :] The following blogs/bloggers have either recently inspired me, or are a constant joy to read. Awww. Thanks! I don’t think I’ve ever inspired anyone before! I *much* prefer email, because I know if I got a letter, no matter how lovely it is to get a handwritten card with a lovely cover … I would take forEVER to reply. And that would be just too evil of me, so at least with email people can expect a prompt reply. :’) And I agree!! People and screens are the most distracting. I am so flattered to be someone who brings inspiration! Thanks for tagging Mandy and I, I can’t wait to get to your questions. Thank you so much! Contemporary is so versatile too (I feel). You can go really fluffy and light, or a bit heavier but it almost always is a win for me. Definitely agree that I go for contemporary books when all else fails 😉 Chicago sounds cool and I love autumn 🙂 Thanks so much for the tag! Contemporary is one of my go to genres too ❤ happy reading!